Jeg laver mad | Italian food made in Denmark! Italian food made in Denmark! 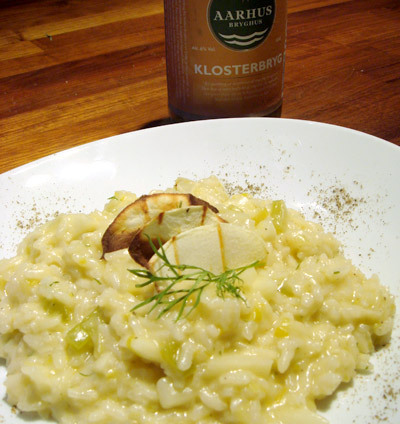 This risotto is a danishification of a nice recipe I have got from Sigrid at CavolettoDiBruxelles.it. It happened that I was supposed to make Sigrid’s dish one evening and I was missing some of the ingredients. So I have used what I had at home: apples from my little garden and beer instead of white wine for the post toasting phase of the rice. Italians would shout “sei matto!!”. I know it’s a big scandal. But at least I have used a very nice beer from Aarhus: The “Klosterbryg” meaning the brew from the monastery (in Italian “convento”). It’s a handmade brew, at least this is what its nice designed label says. It has a quite special taste, I haven’t been thought a sommelier course so far, but I would say it’s a “corposo”, full-bodied taste. The apple from my tree are quite sour so I thought it was a nice idea to add some dill. Both for balancing the taste and for making it more Scandinavian as possible! 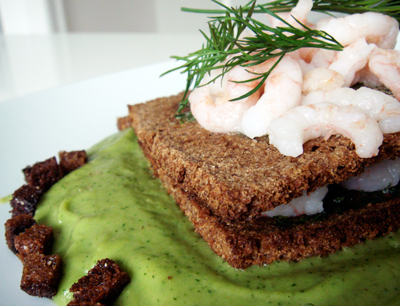 This is the dish once known as rugbrød lasagna. If you are not Danish then you must know that rugbrød is what pasta is for Italians. Many of my good Danish friends had some comments about the previous name. It sounds to me they were claiming that there was something wrong in putting together the 2 words “Lasagna” and “Rugbrød”. Ok, maybe is too early. I have renamed it into Millefoglie. That also describes, in Italian, something that is made of many layers. A little bit more posh maybe. I had a funny conversation with a friend of mine visiting me in Copenhagen. He is a researcher, bio engineer working in the field of proteinomic. He was here with his “Big professor” and I don’t remember why the three of us ended up talking about the fact they had found out that beans and shrimps match together and create a nice taste. The day after I saw Simone Rugiati, on the sat TV channel Gambero Rosso, building up something with some bread slices. Funghi: pronunced fungki, with hard G like in Gitte, in danish “svamp”. Porcini: is a kind of svamp known in Scandinavia as “Karl Johan”, latin name: Boletus edulis. Latin name is not here to show off, but because it’s easy to lookup vegetables in Wikipedia using the latin name. So let’s say you are Finnish or you are Chinese living in Finland: just look up Boletus edulis and you are ready to go to the greengrocer and ask for a “Herkkutatti”. Latin is the English of vegetables. I will try to explain everything into small details so if you already know the basis of this religion you might find it little bit boring. Sorry but this is needed to pass the lore on. 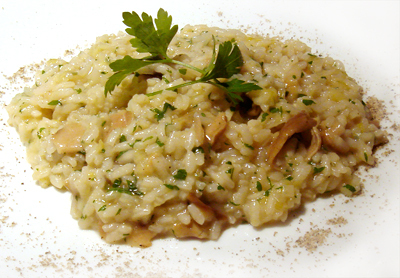 Making a good risotto is quite easy, the first time might taste terrible but then you learn and you will be able to master this science! This recipe is a secret. 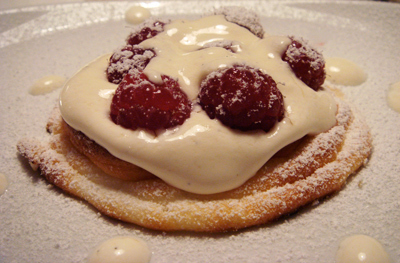 But I really like the picture so it’s here, maybe some day I will publish the recipe as well. This is my food foto blog. 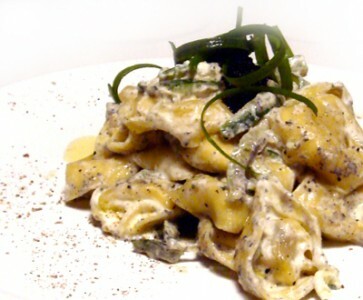 I cook mainly Italian food in the kingdom of Danmark. Mostly for personal pleasure and in order to accomplish the real Italian show-off best practice: “Fare una bella figura” with myself (for more info see B.Severgnini “An insider’s guide to the italian mind”). The result is a mix of Scandinavian and Italian style. The blog will be mainly in English, Danish e se mi gira anche in Italiano. I have been living in Denmark for some years. I was born in Novara (northern Italy, Piemonte) and I had been living and studying in Milan for quite a while. “Jeg laver mad” means “I cook” in Danish; and it’s what I do almost every evening when I come back from work. I have studied industrial design and now I develop 1to1 marketing application, I work mainly with Rails and Flash. Cooking helps me. Food must be perfect. Cooking requires the uttermost attention. This work is licensed under a Creative Commons Attribution-NonCommercial-ShareAlike 2.5 Denmark.